Its necessary, at times, to indulge in the classics. Whether it’s re-watching a favorite movie, returning to a favorite high school haunt or cooking up one of mom’s old recipes—the good stuff stays relevant forever. Tailgating fits right into that wheelhouse, something uniquely tied to a certain time of year, weather and attitude. When the temperature dips just a bit and when the crisp returns to the air in the fall, sports fans break out the grills and coolers for a few hours before and after football games to enjoy camaraderie and prepare for the upcoming showdown. There are certain items necessary for any tailgate party. Just like burgers, buns and beer, items available in hardware stores fill a key role at these events. Grills dominate lawn and garden sections, while the pieces necessary to build beanbag boards can be found in any lumber department. 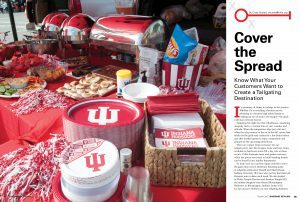 To learn how you can best equip yourself to serve the game time crowd, Hardware Retailing spoke to tailgating enthusiasts Darrell and Shelly Deem, Indiana University (IU) fans who root for their beloved Hoosiers rain or shine each week. 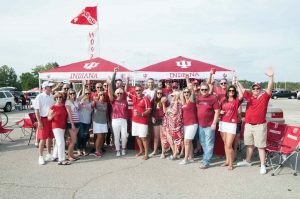 We also looked to Vickie Temple Davison and Kristina Temple Hill, the mother-daughter team behind Bloomington Hardware in Bloomington, Indiana, home of IU, for tips on how retailers can earn tailgating business. Whether your business is located in a college sporting hub like Bloomington or not, tailgating is intrinsically tied to hardware products. From outdoor entertaining to hardware essentials, there are plenty of things you carry to attract a tailgating diehard. The same equipment needed to power outdoor lights on a work site can keep the party leading up to a night game just as happy (well, probably happier than a nighttime work site). Identify items that combine mobility and utility. 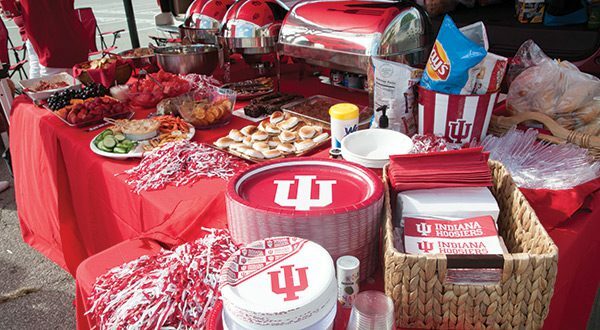 For tailgaters and IU fans Darrell and Shelly Deem, their setup has developed over years of tailgating with family and friends into a truly luxurious spread designed to allow as much fun as possible while limiting the work necessary on the hosts’ part to throw the party. From the satellite dish and TV for entertainment to the chafing dishes to keep everyone fed, the Deems don’t skimp on tailgate comforts. To best impress the tailgate enthusiast, cross-merchandise items from different departments in a central location near the front of the store. While this display may not include a full-size couch (as the Deem family’s tailgate setup does), it can be a great way to inspire a tailgater. Bloomington Hardware in Bloomington, Indiana, merchandises grills outside the store to catch the attention of students returning for school and for football. Don’t break down your summer displays of portable grills and accessories too early. As fall sets in, these displays can be reimagined to focus on tailgate shoppers. Include coolers along with other cooking equipment you stock to give shoppers options on their meal prep. Storage containers and even toolboxes can be easily converted into cooking utensil holders and organization tools for mobile partiers. the necessary products (plywood, beanbags, PVC pipes) in a tailgating section for those customers who want to take on an extra challenge. Every tailgate party is different. Some feature nothing more than a small charcoal grill and a cooler with enough cold drinks for two. Other parties include recreational vehicles full of people and equipment that make you wonder if anyone is actually going to leave in time for the game. to keep track of the scores of their favorite team. The Deems are no slouches in the comfort department, and their setup requires plenty of the equipment and tools found in a hardware store. They usually get to their regular parking spot about three hours before kickoff for home games at IU and begin setting up their base camp for the day. 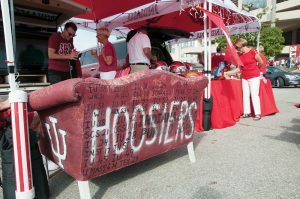 The camp includes a full-size couch with the score of every Hoosiers win they’ve attended with the couch written on its back, as well as a flat-screen TV mounted to their SUV. While grills are often a common sight at tailgates, the Deems prefer the cook-ahead method, putting their meals together the day before then reheating items in slow-cookers on game day. Putting together that type of spread needs the help of a hardware retailer, Shelly says. Items range from consumables and add-ons (drink koozies, folding tables, large coolers designed for catering multiple meals) to large-ticket items that are staples in many retail locations (grills, generators, heavy-duty extension cords and brackets to attach TV and satellite equipment to vehicles). Shelly and Darrell highlight needs like a flagpole holder that is held in place under a car’s wheel as a go-to item from a hardware retailer. Flag poles made out of PVC piping and outdoor lighting are also items that may already be a part of your regular order. Sometimes it takes tearing things down to build them better. Davison’s and Hill’s decision to remodel the interior of Bloomington Hardware led to rearranging the aisles and shelving displays. That change made the entry area for Bloomington Hardware more inviting, Davison says, and that has played well into the business’s plans for tailgating. 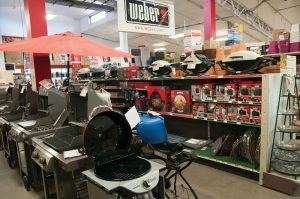 A comprehensive grill category should include a range of grill sizes, including portable grills most often used by tailgaters and a variety of grilling and cookout accessories. “We have this great area now for customers when they first walk in. It’s led to unexpected combinations, like using the wider aisles to feature large storage bins that have been a hit with tailgaters for packing up their equipment,” she says. 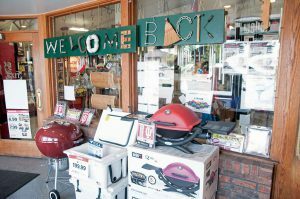 Bloomington Hardware has established two priorities for meeting tailgating customers’ needs: consumables and unique items. Products like one-time use charcoal bags, small gas containers for grills, lighters and lighter fluid and cleaning chemicals and wipes have helped build the store’s reputation for being a tailgating destination, Hill says, citing an endcap display for paper towels that has quickly sold out in past tailgating seasons. The endcap display highlights how simple items, when displayed prominently and priced right, can garner sales from tailgaters who are in a rush because they forgot items at home or who simply expected to pick them up near their tailgating site. Bloomington Hardware’s unique items that do well include standard products that feature small details to set them apart. For her business, Davison says having grills and other equipment in the appropriate colors for IU fans is a big factor. Stocking products in colors and logos of popular teams will draw in a crowd of enthusiastic shoppers ready for game day. When outfitting your tailgating display, consider items branded for local teams. A customer who already has a folding table might consider another with their team’s logo, and if your location is closely associated with a tailgating hotspot, the products aren’t likely to languish on the salesfloor. For tailgaters and retailers alike, the primary goal is simplicity and access. As football season heats up and the temperature outside cools, consider these tips in your store to keep area tailgaters happy. 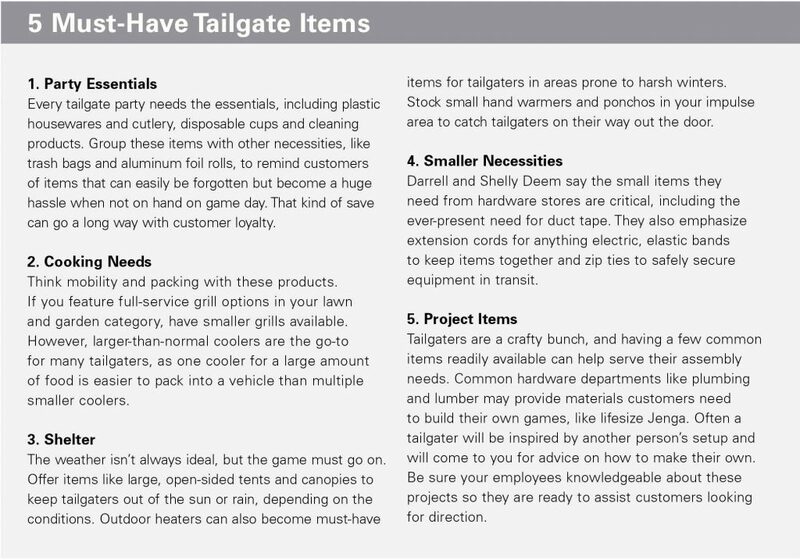 Stock common consumables in prominent areas of your stores and make sure your employees are ready with useful tips and items for anyone looking for their next tailgating projects. And don’t forget to enjoy the game, too.